I was doing a little bit of research on the game, looking at gameplay vids via "da tube," and eventually took a peek at the Wikipedia article on it. Due to its storyline, Gunvalkyrie is classified into the steampunk genre. Being curious, I wanted to know what other games and movies they mentioned as examples of steampunk, and because I thought they might have missed some. Well, they didn't really, and managed to educate me a bit more. A fascinating bit I came across was that one of the inspirations for the steampunk genre was Charles Babbage. Yes, the very person who Gamestop stores, formely known as Babbage's, were named after. His contribution to steampunk comes from his designs for the Difference Engine, a steam driven mechanical computer. In fact, it was the first computer ever designed it seems (but not the first to be conceived). What's more incredible, is that Babbage's designs for a mechanical computer preceded the creation of the first computers by about a hundred years. Lack of support and funding, not helped by the fact that he was apparently a complete jerk, made it impossible for him to actually create the Difference Engine. However, a replica was created in London in 1991 (hence the photo above). 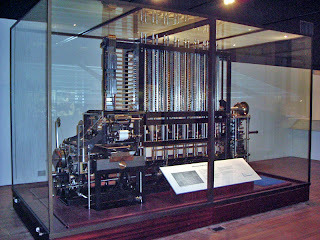 Just imagine if Babbage would have built this back around 1850, what that would mean to computer technology. Well, I don't know what it would mean. I suppose maybe nothing, or maybe it would have revolutionized technology and things would be quite different now. The next bit I found that further intrigued me was that a thorough analysis of Babbage's Difference Engine was written by a woman named Ada King, Countess of Lovelace. Her analysis has caused her to be attributed the honor of being the first computer programmer. Who would have thought, that the first computer programmer was a woman! Go Ada go! So there you have it. Now just sit back and conceive of the alternate realities these facts may have given rise to. When you're done, go look for some hot steampunk media, like Steamboy or City of Lost Children. Then go look for some hot computer programmer with a flare for Victoriana.